TRADING COMMODITY FUTURES AND OPTIONS INVOLVES SUBSTANTIAL RISK OF LOSS AND MAY NOT BE SUITABLE FOR ALL INVESTORS. YOU SHOULD CAREFULLY CONSIDER WHETHER TRADING IS SUITABLE FOR YOU IN LIGHT OF YOUR CIRCUMSTANCES, KNOWLEDGE AND FINANCIAL RESOURCES. Tuesday the USDA released the April World Agricultural Supply and Demand Estimates (WASDE) report. 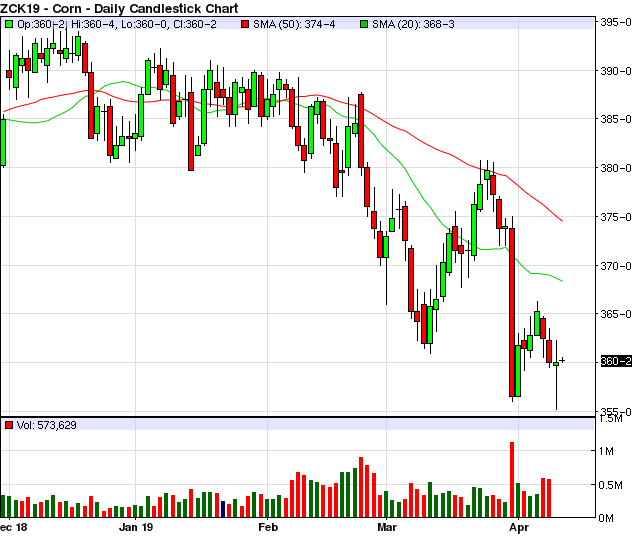 For corn it was a mostly bearish report as the market seemed to expect. With ending stocks back over the 2 billion bushel mark corn supplies are ample if not a little overbearing. Where do we go from here? On the March 29th Quarterly Grain Stocks report the USDA found that corn stocks were 270 million bushels higher than expectations. We knew that some of this would find its way to the overall final anticipated stocks of corn in the form of lower demand. We also knew that lately ethanol and export demand has looked especially weak compared to expectations. In the WASDE report the USDA saw fit to lower feed/residual demand by 80 million bushels, lower export demand by 75 million bushels and lower corn used for ethanol demand by 50 million bushels. This added 200 million bushels on to the projected ending stocks for corn. So, of the 270 million bushel higher 2nd quarter stocks 200 Mb are projected to make it to the final stocks number. This would suggest that demand will need to pick up for the second half of the marketing year or further increases to the ending stocks estimate may be warranted. The big changes made on the April WASDE may satisfy the USDA for now as they get ready to produce the first WASDE estimate for the new crop which we will see in May. With the worst of the news maybe out of the way for now, a record large fund short position and some interesting weather potentially threatening planting corn may have just found a near term bottom. A short covering rally could create some opportunities for producers to sell at higher prices. Longer term I am worried about corn. As I have been saying, big crops in South America coupled with a significant SA currency advantage could lead to significantly less export market shar for the US starting now. At the same time the EPA is breaking the law and destroying ethanol demand by undermining the Renewable Fuels Standard. If we can not get some positive demand news we could still end up with significantly higher stocks. Also, with increased acreage (or even steady acreage) we may overproduce corn yet again barring any major crop damage. Yes, there are scenarios where the outlook can change dramatically for corn - Weather problem, a favorable trade deal with China, renewed ethanol demand... But, if nothing changes prices could still be (much?) worse in the fall. It seems to me that that marketing could be a very important part of a farming operation this year. Locking in prices while managing to keep some upside potential is what we are trying to do. It wasn't the USDA that sunk the corn market. It was the demolition of the ethanol market via those Rin waivers. 100 percent of the increase in stocks is from the reduced grind in the ethanol industry. This will not change as long as this administration keeps a pro oil administrator to head the EPA. Trump says he loves farmers and then turns around and allows this bs to happen.